In fact, Bowdler’s work was appreciated in Victorian times, and poet Algernon Charles Swinburne credited Bowdler for making Shakespeare approachable for children. But today, the word “Bowdlerize” signifies the reworking of a piece to make it less offensive, but also weaker and less effective. That’s sad. It’s a rough-and-tumble world out there, and if you can’t handle viewpoints that challenge your sensibilities, you’re in for some rude shocks. I see this as yet another symptom of a society that’s self-segregated itself into prickly, snarling little dens of conformity. Too many people see the world through a pre-fabricated lens and as a result, cannot cope with views from outside their cocoons. If all you know of the world comes from Fox News or Huffington Post, you feel you must condemn all who fail to uphold the One True Way. Get away from that computer. Go outside. Talk to real people. At the very least, dare to consider ideas from outside your “Favorites” list. I’ve heard that in the 18th century, King Lear was routinely performed with a happy ending, on the grounds that the original would shake the whole world view at the time. If I recall, the greatest reader of the time, Samuel Johnson, read the original and said it was the only book he could not read twice because the ending so troubled his mind. In our world, there is both what is ugly and beautiful. However, we shouldn’t live in a cocoon. If we shy away from what really is then we are choosing to close our eyes. We need to acknowledge the existence of both in order to achieve balance in our lives. Censorship has its place when it doesn’t overreach beyond what is necessary. My fear is that there are people who are actively trying to restrict what others may and may not read and hear. Now that’s a problem. Yeah I agree, Mike. It is a very real problem. I didn’t know the term! You hooked me with that great opening paragraph to this post, and I learned something fascinating. Thanks. Amen. 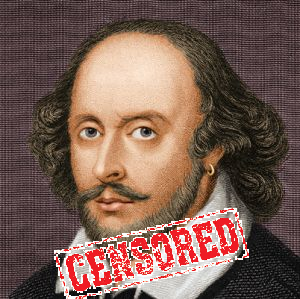 For writers and artists, censorship is as evil as banning a work or expression. As usual, excellent post, Mike. I appreciate that. And yes, censorship, whether by individuals or the government, accomplishes nothing but dumbing down everyone.